Hello friends, how’s your week going so far? Isn’t it crazy we’re on the last week of January? Yesterday, I did a super fun Valentine’s Day shoot at Blink Inc with my family. 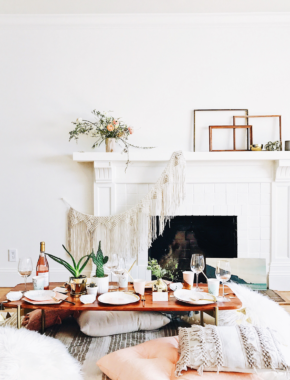 It turned out so adorable and I’m DYING to show you the pictures next week! 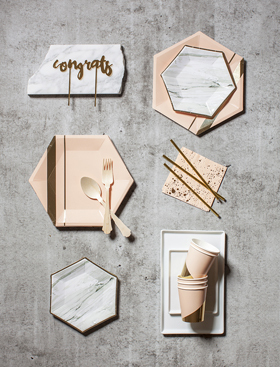 I’ll also be hosting a fun giveaway next week with Blink offering a free portrait session so stay tune for details. 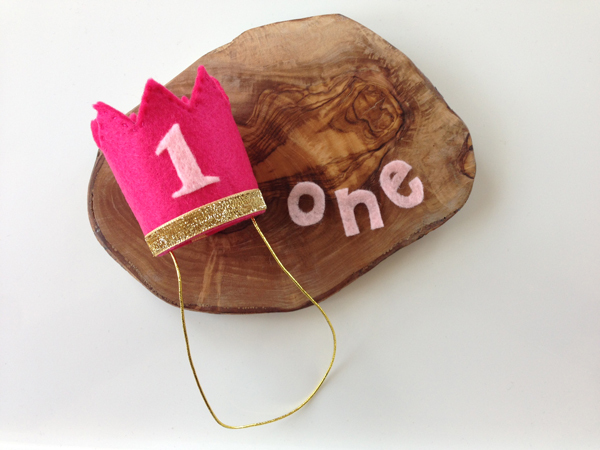 For today, I want to share a DIY with you on making this really cute felt birthday crown. 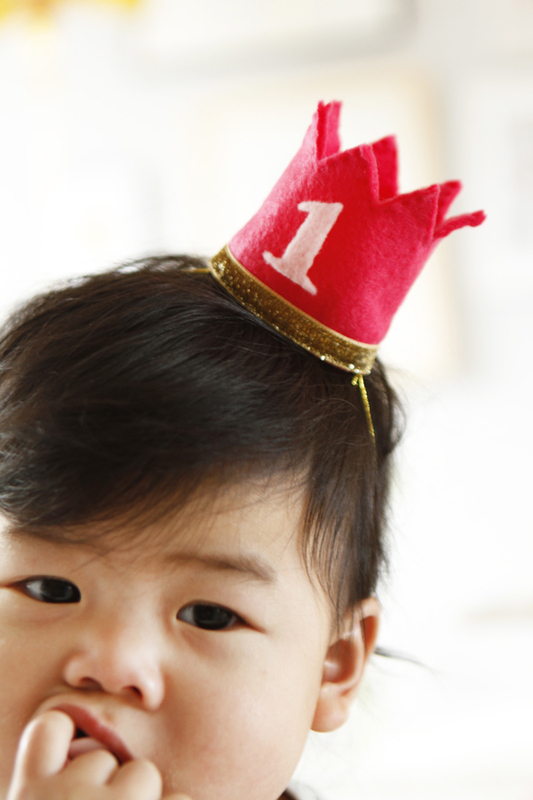 Hadley wore it on her 1st birthday party and I just thought this little crown was the cutest thing on earth! I first saw it on an Etsy shop called Little Blue Olive, but because I saw it just 5 days before Hadley’s birthday and I didn’t want to pay for the rush job and shipping, I decided to go with a DIY. 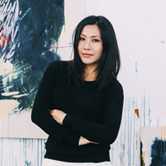 I asked my talented friend, Christine, who makes really pretty and delicate jewelry at Abacus Row, for help. She made one for me last minute and I was so happy to get one! 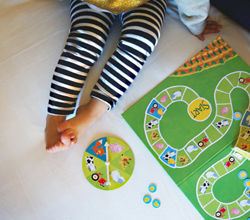 I thought some of you may want to make one for your kiddo, or yourself, too! I don’t judge :) As promised, I had asked Christine to share her tutorial here. 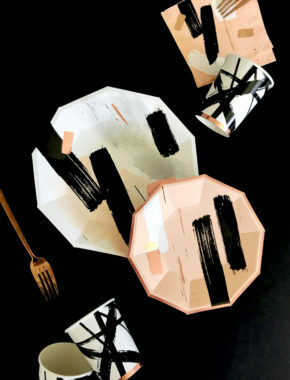 I think it’s worth a try with your crafty hands. Alternatively, you can always buy one at Little Blue Olive because the maker offers so many different styles and they are inexpensive! Step 1. 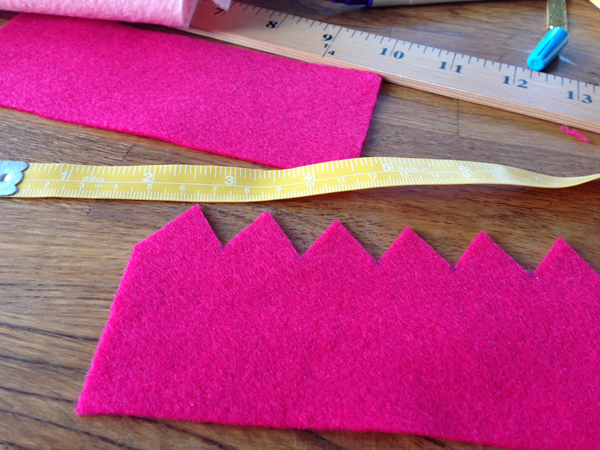 Using the hot pink felt cut out two – 2.75”x6.25” rectangles. 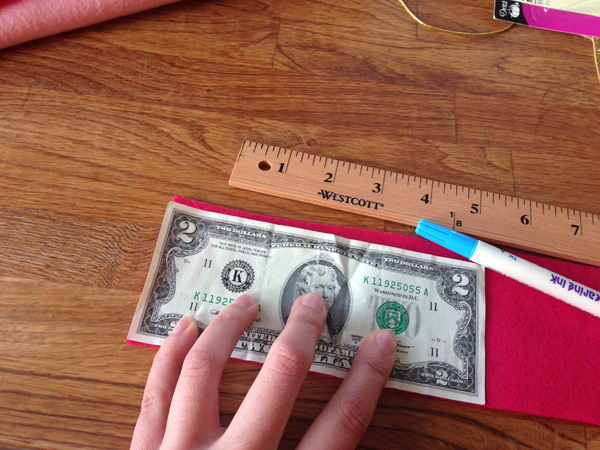 A dollar bill makes for a handy template since it is approximately the same size. Step 2. 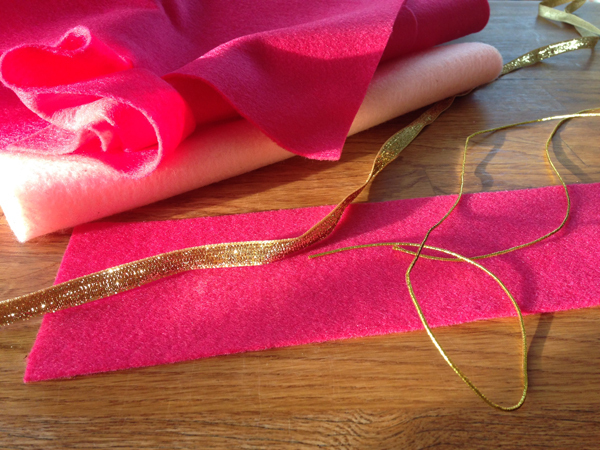 Lay the two rectangular pieces of hot pink felt directly on top of each other. Glue the two pieces together. This is to make the felt thicker and more sturdy. Step 3. Cut out the 7 points for top of the crown – /\/\/\/\/\/\/\. About ¾” below the top edge of the rectangle, make a mark at every 0.9” interval (each of these markings represents the base between the peaks). Along the top edge of the rectangle make a mark at the approximate center between every two marks below (these marks represent your crown points). Cut out the zigzag pattern that these marks create when you connect one to the next. Step 4. 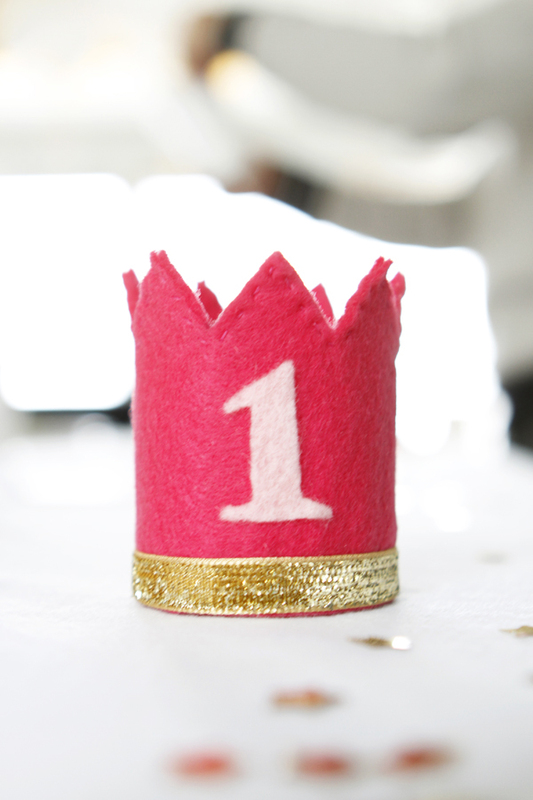 Apply the gold ribbon along the bottom edge of the crown with the fabric glue and leave a little bit of extra ribbon hanging off both edges. Step 5. Keep the ribbon-side facing out and bring the left edge around to connect with the right edge. Glue the sides together at the base by gluing the bottom bit of extra gold ribbon from the left side to adhere to the top of the right side. Then glue the top of the extra bit of gold ribbon on the right side to the underside of the crown on the left edge. Step 6. Using hot pink thread stitch the right and left edges together at the top and another time in the middle. Step 7. 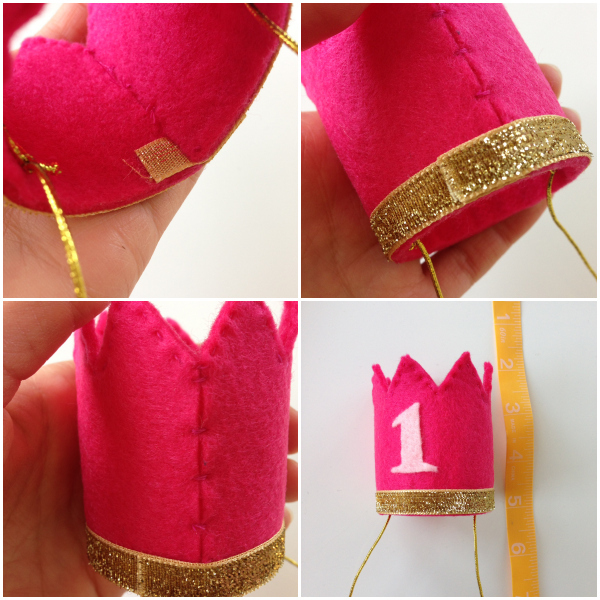 Using the light pink felt cut out your number 1 – or any other number or letters you’d like. If you’re not excited about free handing this part, I recommend printing out the number 1 using the font cambria in size 120 and bold, and then cutting it out to use as a template. Glue the number right in the center of the crown. Step 8. Attach the elastic cord to the crown. Tie small loops on both end of the cord and attach the cord to the crown by stitching through these little hoops. To keep stitches from showing on the outside only push the needle through the first layer of felt. Complete this for both sides and you’re done! Step 9. If you want to add a little more detail, use your thread and needle for a simple stitch along the top edge of the crown. Thanks so much for sharing your tutorial with us, Christine!